I love meatloaf. My mom didn’t cook very often- no family dinners for us- but every now and then she’d whip up a batch of meatloaf and I would be in heaven. This recipe is kid friendly because of it’s presentation rather than it’s ingredient list. Sometimes just making something look a little different, a little fun, is enough to get that finicky kid to pick up their fork with a grin! Pre-heat oven to 350. Mix all meatloaf ingredients together in a large bowl and blend well. Shape into balls and pat down lightly into an ungreased cupcake baking sheet. Meatloaf shrinks a little when cooked so filled the cups quite full leaving a little room for the fat. While they are baking chop up potato and boil and then mash with a drop or two of milk. Divide potato in two bowls and add mustard to one and ketchup to the other. 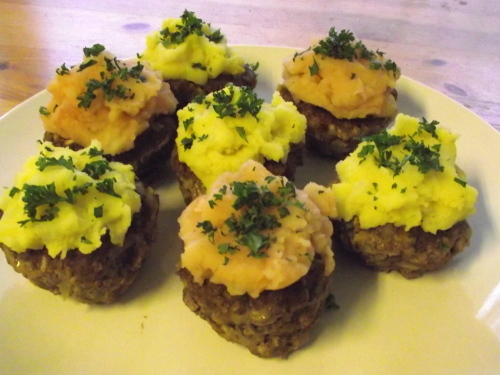 Remove meatloaf cupcakes from tin and top with mashed potato. Decorate “frosting” with shredded carrots, peas, chopped broccoli heads, or any other thing you can think of.